Each October I chase fall colors from West Virginia to Maine. This year I was headed to Vermont when a chance encounter at a rest stop changed my direction. A gentleman said the Adirondacks were peaking and well worth a look. I took his advise and it was very good advise! The fall colors heading up toward Lake Placid were as good as I have ever seen. It was overcast all three days I was there, but the mist in the mountains made the trip worth it. Why only one, Bridges? This is only a teaser and makes me want to see more. It is so great to catch an OP! Great story and image. You have to come west to Colorado one year. The colors you will find in Ouray Colorado and surrounding areas are like no where else on earth. Gotta love the Adirondacks. I took some great pictures there in the early 70's (slides of course). Reflections can be quite something. Would like to get back there some Fall. p.s. The Adirondack Museum in Blue Mt. Lake is worth a trip any time of year. Beautiful colors and composition! Good job! That is a very beautiful and colorful image. 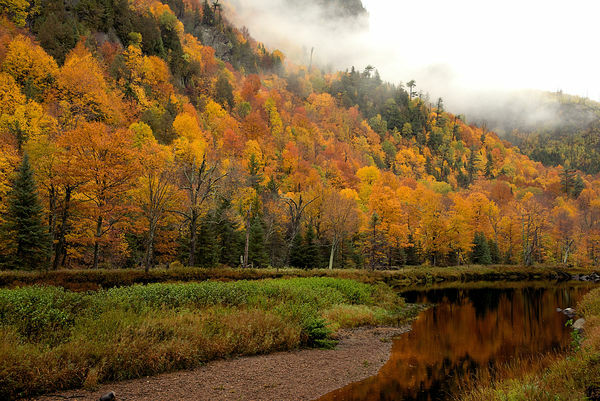 There’s a LOT to see and do in Adirondack State Park. At over 6 million acres, it’s larger than Glacier, Grand Canyon and Yellowstone National Parks combined.